For Mounting Antenna Rotors onto 1.25 inch "T" post. Fastens to 25G Tower Rail with Saddle "U" Clamps. The Rohn 25G tower is a popular choice for large VHF/UHF antennas and medium sized HF antennas. The 25G tower can be used in guyed, self-supporting or bracketed configurations according to specifications in the ROHN catalog. 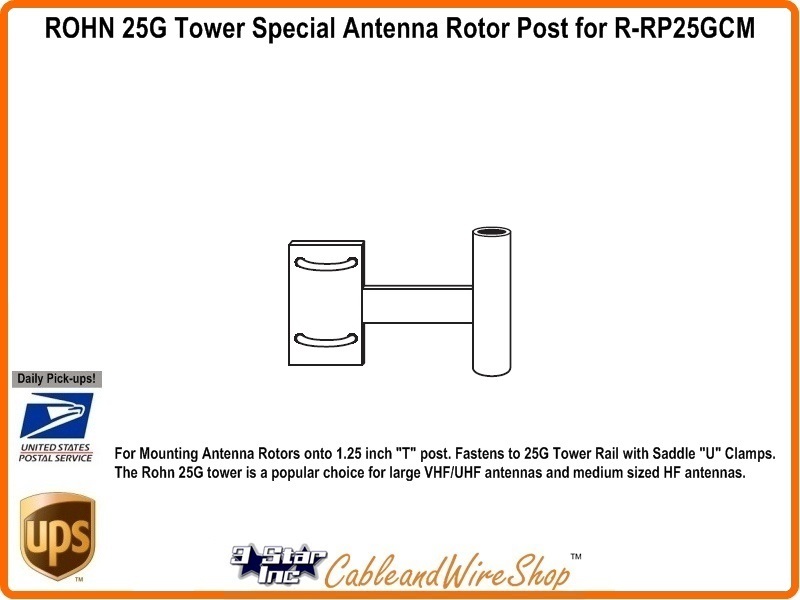 Consult ROHN Catalog Links at Footer Section below for ROHN 25G Tower Details..
ROHN RP25GCM Antenna Rotor Post is Galvanized Steel "T" Tube Post with (2) "U" Bolts to attach to any Side Rail anywhere on a 25G Tower Section for Mounting a Special CM Attachment Style Light Duty Antenna Rotor onto the Post. American Steel... Buy ROHN, Buy American.